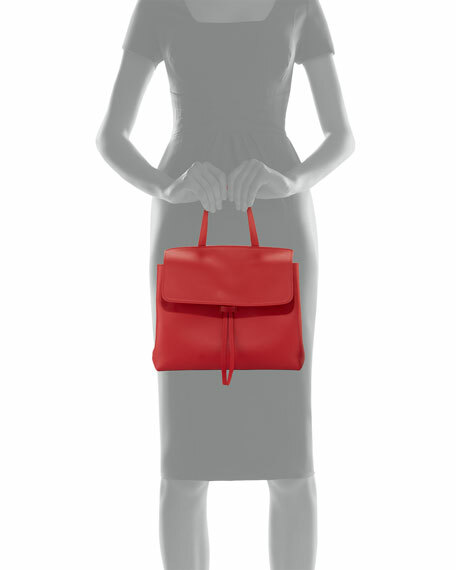 Mansur Gavriel vegetable-tanned calf leather top-handle bag. Flat top handle; approx. 6.3" drop. Removable shoulder strap with 21.5" adjustable drop. Flap top conceals threaded drawstring top. Contrast coated leather interior; one slip pocket. Embossed logo at bottom center. 8.5"H x 12"W x 4.5"D; bag weighs 1lb. For in-store inquiries, use sku #1706604.